I just discovered the Robertsons and it’s already the end of their third Season – that’s the bad part. This episode was about a trip they took as a family and it was nothing like the trips we’ve seen with other reality stars – that’s the good part. Even Willie realizes that he’s been working too hard at running the family business. After installing a hydraulic work table that doesn’t allow for anyone to sit down, the Robertsons let him know that they’re, well, they’re not going to stand for it. Willie and his wife Korie give everyone in the family a gift – aloha shirts – then ask them to guess where they might go to wear them. Phil guesses The Netherlands, but Jep’s wife correctly guesses that the real reward is a trip to Hawaii. So off they go, to spend some time on the white sandy beaches of Kona on the Big Island. Phil still isn’t thrilled with the idea because sand will get into every orifice of his body and half-naked women will be running around, but Miss Kay reminds him that they never had a real honeymoon and that there’s no better place for one than this chain of beautiful and romantic tropical islands. They arrive only to find out that the airline’s lost Willie’s luggage. To make matters worse, the hotel doesn’t have a room for Uncle Si, it won’t be ready until the next day, so Willie and his family will be sharing their suite with Si. Si seems to be a bit confused about just where he is. He greets the women who are handing out leis with “Hola, senorita”, and asks the concierge where the Mayan ruins are. The next morning, Willie’s luggage still hasn’t arrived, so he’s put together an outfit he bought at the gift shop – his Hawaiian shirt and a colorful, floral print sarong. Si, however, thinks he’s now Tom Selleck, wearing the same red, flowery shirt and sporting a Detroit Tigers’ baseball cap. He announces to everyone that he’s Magnum, P. SI., so Willie offers him $500 to go find his luggage. Phil and Miss Kay haven’t left their hotel room yet. He’s found a marathon of Jason Bourne, – “a cross between James Bond and MacGuyver” as well as “the ultimate redneck” – movies on television and Miss Kay is spending her time either napping, gushing over the contents of the gift basket and scent of the flowers, or pointing out the magnificent views from their hotel room to her husband. Willie can’t quite get the notion of a relaxing vacation and has an itinerary of activities, starting with surfing lessons. The ladies prefer to stay behind at the pool and enjoy some of what the spa has to offer, so Willie, Jase and Si, together with some of the boys, head off to learn how to ride the waves. Willie tells them that he knows how to surf because he saw “Point Break” with Keanu Reeves. Si’s rattling off all kinds of surfer lingo, dude. The teenage boys find the teenage girls on the beach a bit more interesting, but Willie’s daughter, Sadie, takes to the board like a natural. Her dad’s attempts at the sport aren’t quite as successful as hers though and he falls more times than his usual limit. Miss Kay has found a way to get Phil away from the TV and his fantasies about his own Bourne identity. She’s arranged for them to have massages, but Phil doesn’t think this is the type of activity normally suited for rednecks. Miss Kay wins, naturally, and the couple are treated to a relaxing afternoon. Phil doesn’t loosen up right away, though. He refuses to take off his pants because he’s afraid of what might happen given the last time he removed them for his doctor. As his wife tries to get him to shut up, Phil tells his masseuse all about his most recent prostate exam – every uncomfortable detail. Jase has had about enough of Willie’s itinerary, but his older brother tells him that he’s got a real and very dangerous adventure planned, deep in the jungle. It turns out to be a tour, along a paved path, through the trees, on Segways. Of course, Si and Jase turn the Segways into something entirely different playing chicken with them, falling off of them and with Si declaring that the machines are like modern chariots. Jase is at his wit’s end now and stops along the path to climb into a stream. Si follows, along with Jep, but Willie is trying to stick to his agenda. He does eventually climb into the water and the group ends up at the ocean, near a 20 foot tower. Si now has all the proof he needs that the Mayans inhabited Hawaii. It may not be the Mayan ruins, but who in their right mind is going to argue with Uncle Si. They wade through the water and climb the stairs to the top of the tower, while chiding Willie about his attitude, his itinerary and his seemingly lost spirit of adventure. Jep is the first one to take the leap, followed by Jase, but Willie is having none of it. His brothers plead with him and tease him, while Si walks around clucking and flapping his arms to demonstrate what a really big chicken Willie is. The CEO finally jumps in, proving his manhood and improving his family’s opinion of him. Even he has to concede, “Every now and again, you have to let your beard down and be a little spontaneous.” He does try to take credit for this little diversion, though, claiming that he left exactly 22 minutes on his schedule for unplanned activities. The episode ends as they all do, with the family gathered around a table and offering a prayer of gratitude for everything they’ve been given, as well as the love they have for one another. On this occasion it’s a luau, complete with a traditional pig roast, a fire dancer and the backdrop of a sunset that only Hawaii can offer. It’s been reported that the Robertson family is in contract negotiations with A&E, which is holding up production for Season 4. They’re asking for $200,000 per episode, a big increase over what they’ve gotten for the first 3 years, but nowhere near what other reality stars have received. The finale for Season 3 broke the record for A&E’s programming, coming in at 9.6 million viewers for the hour-long special. I’d like to see A&E just pay them, whatever they want, just pay them. For once, it’d be nice to see some good people being rewarded for providing this kind of family entertainment. This entry was posted in Duck Dynasty and tagged A&E, Duck Dynasty, Jase Robertson, Uncle Si, Willie Robertson. Bookmark the permalink. 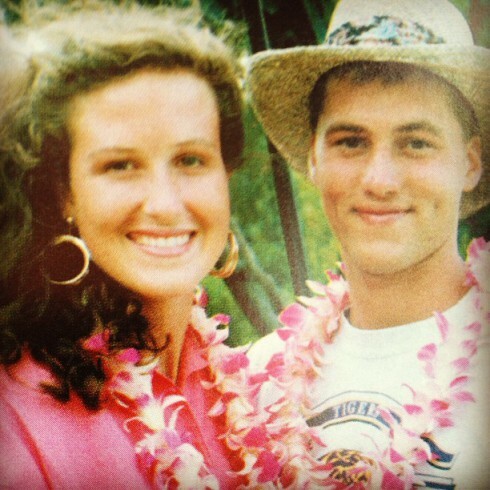 9 Responses to Duck Dynasty – Aloha, Robertsons! Empress….I LOL’d through this entire recap and the images it conjured in my mind. I have not had time to catch up with my DVR (so many shows, so little time) and see this season yet, but now I am determined! This is such great entertainment and I so prefer it to the other garbage that is slithering across our TV screens! BB is right. A & E just needs to pay them. They are business peeps themselves and they know their worth. Also refreshing, because they ARE actually worth it! Mardrag! It’s really the funniest thing on TV. I’ve DVR’d a bunch of episodes and when there’s nothing better on, I always have Duck Dynasty to make me LOL. I was surprised at how little they were asking for in their next contract. IMHO, a dozen or so Robertsons must be worth more than one Kardashian. This is what entertainment reality TV should be all about. Entertainment. You have the brothers pseudo bickering and settling their differences with contests rather than beating each other up in any way.. Except when they duct taped Jep to a post to show, who the older brothers still are.. Sprinkle in some quips of wisdom from Phil, some of crazy uncle Si, some of Miss Kay getting what she wants in her own way, reality TV gold. I know there is probably a lot of play acting there but it’s still clean fun to watch.Let’s see if the execs at A&E are smart enough to catch on to that. One Robertson is worth more than ANY Kardassian. I’ve caught the show a couple of times, my son loves it! I just caught up on the last 2 episodes of Game of Thrones. I wasn’t sure that I would keep up with the series, but episode 3 & 4 were pretty shocking…. now I’m hooked.